Your home computer runs your must-have programs and contains your important files and documents. That’s why having the ability to control and use it remotely can be very useful. Fortunately, there are many free tools online that will allow you to use your computer from anywhere ! One of the most popular remote-PC program, used by millions worldwide ! I like this service because of the simplicity. Anyone can configure and use it, nothing complex at all. The software can be downloaded online for free (supports Windows, MAC, Linux, iOS and Android). You can also control your computer from your smartphone, thanks to TeamViewer’s free and easy to use mobile apps. 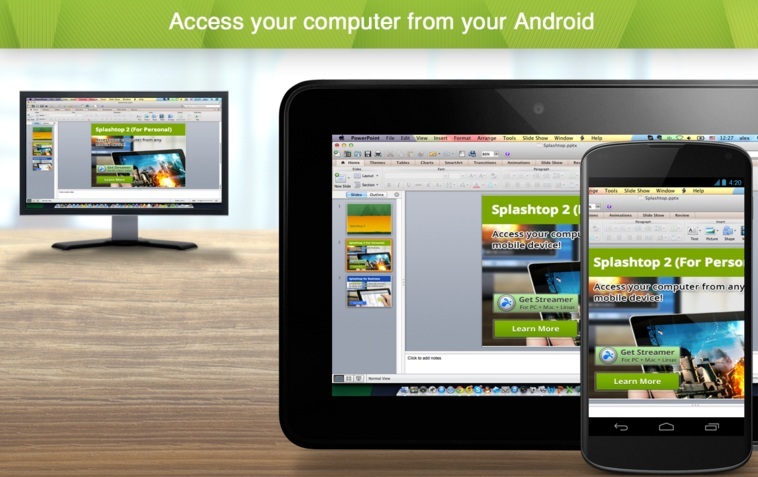 Splashtop is a free remote desktop software as well. It’s easy to use, and allows smooth audio and video streaming (it’s biggest advantage). Supports different platforms (Windows, OS X, Linux, Android, iOS). Great for watching videos on your tablet without downloading any apps (just “stream” from your computer). Install the Chrome Remote Desktop app in seconds, and remotely control your computer from your smartphone or tablet. Everything runs in the browser – a very big advantage. This “app” has less options than TeamViewer for example, but if you need a basic remote control software – it’s perfect.